With many students graduating from college, there are thousands of individuals venturing out into the “real” world for the first time. 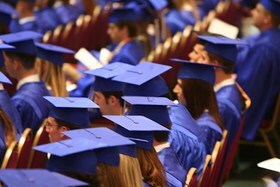 Graduation often marks the first time that young adults begin to make their own money decisions, and begin to understand the consequences of their financial choices. Many students underestimate the importance of good credit. However, building a good credit history is more important than many people realize. Good credit can mean that you save money on insurance premiums, and that you avoid paying a security deposit when you purchase cell phone service. Good credit can save you money, and even help you avoid being passed over for a job. Not only that, but if you want to be able to complete certain transactions, such as buying a home, you need good credit — especially if you want to avoid paying thousands of dollars due to higher interest rates. It’s easy to mistake credit cards for a source of money. However, they represent loans. While credit cards can be a fast way to build credit, they also require some restraint. One of the most important things to recognize is that the money isn’t yours. You’re borrowing it from the credit card issuer, and if you carry a balance, you will be charged a high rate of interest. Rather than treating credit cards as another source of available money, they should be treated as loans — since that is what they are. The biggest factor influencing your credit score is your payment history. This means that you need to make sure that your payments are on time and in full. If you mail in a payment, make it a point to send it at least 10 days in advance (two weeks is better). If you pay online, schedule your payment so that it “arrives” in plenty of time. Missed payments can quickly drag down a credit score. Create a schedule so that you know when your payments are due and pay them on time. Realize, too, that non-credit payments can also affect your score. Missed medical bill payments and missed rent payments can be reported to the credit bureaus and pull down your credit score. Many people think that building a good credit profile means that you have to get into debt. While it’s true that you often have to use credit in order to build a credit profile, this doesn’t mean that you need to be in debt. You can build your credit history with the help of a credit card, but you don’t need to carry a balance and pay a high rate of interest. Pay off your credit card each month, using your card as part of your budget. As long as you are careful to only buy what you already have the money for, it’s possible to avoid getting into debt. Carefully plan your purchases, and you can build a good credit profile without becoming overwhelmed by debt. There has been a move toward using alternative scoring models that don’t rely on credit. These models claim to use items like rent payment, utility payments, and other payment histories to help build a history that shows that you are responsible with your money. While these alternative scoring models can, indeed, help you establish some financial credibility, you will pay for these services. Often, you have to pay a fee to set up a situation by which an alternative reporting agency will gather information about your payment activities. Additionally, you have to convince your services providers or landlord to agree to report to these agencies. Some agencies, like eCredable, will get the information for you just as you apply for loans from partners. However, you have to pay for this service, and the information is no longer “current” after 60 days or so. While you can use alternative scoring, it’s a long process, and there’s no guarantee that it will work. Great tips Miranda! I think they’re all important, but I think many overlook #1. I have seen people not get a job offer because of a bad credit score. It definitely does happen and is not worth the risk in my opinion. People seemed to also forget that you have to pay them back…goes with they are loans and people shouldn’t borrow what they don’t plan on paying back. In addition to paying on time don’t just pay the min payment if possible pay the entire balance off.